The SP2i will be Kia's first offering in India and is based on the SP Concept shown at the 2018 Auto Expo. 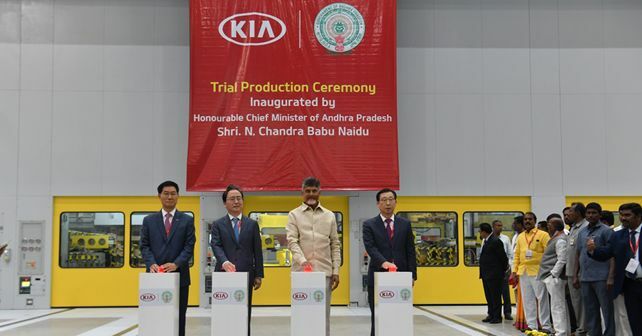 Kia Motors India (KMI) has today announced that trial production at its new manufacturing facility in Anantapur, Andhra Pradesh, has begun. The announcement marks a significant milestone for the Korean carmaker here, as the construction of the 536-acre facility is over now and, more importantly, it heralds the arrival of Kia's first model for India. While the India-bound SUV is based on the SP Concept (first seen at the 2018 Auto Expo), it has been christened 'SP2i'. The trial production of the SP2i will thus set the tone for the series production of the car, which is expected to begin in the next few months. A special launch ceremony to mark the start of trial operations took place today at the Anantapur plant, in the presence of chief guests N. Chandrababu Naidu (Chief Minister, Andhra Pradesh) and Mr Shin Bongkil (Ambassador of the Republic of Korea to India). Also present at the ceremony were Mr Han-Woo Park (President & CEO, Kia Motor Corporation) and Mr Kookhyun Shim (MD & CEO, Kia Motor India). In order to reinforce Kia’s commitment to supporting the Andhra Pradesh (AP) government in promoting the use of EVs and in the development of the corresponding charging infrastructure, KMI consolidated its Future Mobility Partnership by handing over a unit of its Soul EV to the AP government officials. While we are aware that the SP2i will share a majority of its underpinnings with its sibling, the Hyundai Creta, what's interesting here is that KMI might position the SP2i as a premium offering. This means that some premium features like a 360-degree camera, Head-up display, ambient lighting and wireless charging could make their way on to the SP2i. However, the feature and spec details have not been furnished by KMI as this point, and we'll have to wait for a few months for verified details to emerge.